The establishment of the Bias Incident Response Team (BIRT), whose “primary focus is to outline a set of responses that will provide assistance and support for individuals who are the victims of a bias incident. Following the opening ceremony, the episode “Mammy Dearest” of the television series A Different World was shown. Also in the Goshen, the following black student groups were on display to provide information about their organizations: Collegiate 100, National Association of Colored Women's Club, Intervarsity's Black Campus Ministries, My Curlfriends, Black Girls Rock, Black Student Union, Omega Psi Phi Fraternity, Inc. and Emperial Dance. “I love my black heritage because of its uniqueness, culture and history,” said Kaesha Booth, a junior majoring in sociology. 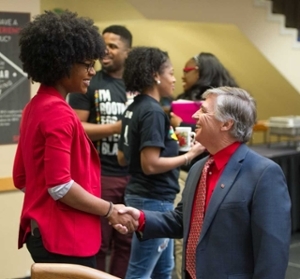 Marissa Williams, SIUE Black Heritage Month chair, welcomes SIUE Chancellor Randy Pembrook to the SIUE Black Heritage Month Opening Ceremony.